Voicemeeter Potato (VMP) is here! Potato adds a third virtual channel so that we will be able to mix VAC1 (RX1) and VAC2 (RX2) audio together. 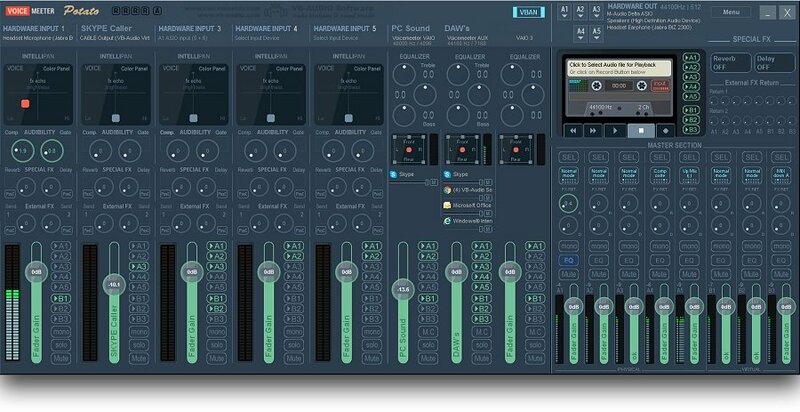 Or be able to mix and route to two different digi mode programs independently. Or whatever! There are a bunch of other new features as well, but those are mostly of interest to podcasters. Personally, I would have preferred a fourth virtual channel over more hardware inputs, but I don't write the code! Re: Voicemeeter Potato (VMP) is almost here! Yes, running it here now! It is much improved over Banana. The new drivers are VERY fast. I put VAC1 with ASIO on VAIO3 and VAC2 with WDM/KS on AUX. Then I tuned in the same station on RX1 and RX2. There is now only the tiniest perceptible delay between the two. With both VAC1 and VAC2 simultaneously into VMP (<--Voicemeeter Potato ) I can now more easily utilize RX1 and RX2. I connect all my digi mode software to the VAIO channel (I hate the channel names) and can easily route audio to/from either RX1 or RX2. It's great! And of course I have my mic and speakers attached with ASIO to hardware input and output A1. I'm also using VBAN to send audio to my phone and tablet so I can listen when I'm not in the studio. Sometimes I do this with Chromecast, too. Re: Voicemeeter Potato (VMP) is here! I just edited my first post to fix the title of the topic! My Ryzen based PC does not seem to like potato at all ( a bit Ironic since I'm Irish) . Computer froze and even blue screened at one point. Back to voicemeeter banana for this cowboy for now. You should drop VB Audio a line on Facebook. I've found them to be quite responsive. They are indeed responsive Scott thanks for the suggestion . I'll stay with banana for now , I'm sure if its a ryzen issue someone else that needs potato will let them know. Scott you mentioned on the mail list that potato drivers are better than banana , I wonder in what way are they better ? I'd appreciate if you could share your observations please. VAIO Internal Sample Rate will be automatically set by Voicemeeter to fit the main stream sample rate. It will allow getting signal without any sample rate conversion (so will always get the best quality and less CPU load, because SRC takes notable CPU resources). VAIO Internal buffer size could be adjusted by the user on the fly, without having to reboot and without having to restart audio engine… Then it will be faster and easier to find a better latency on Virtual I/O. But the crucial point is in the Audio Streaming Communication between Voicemeeter and the new Virtual I/O driver that will be direct! It means it won’t take any system resource (no IOCTL functions usage) and cannot be disturbed (no DPC pending). As I mentioned above, the biggest indication that the drivers have improved is that the speed differential between ASIO and WDM-KS is now quite minimal. Still audible, but it's not an obvious echo any more, just the tiniest bit of delay. For those who want to use RX1 and RX2 for diversity operations the very slight degradation in latency to go to WDM-KS on both VAC1 and VAC2 to keep audio synchronized would be definitely worth it IMHO. Have you got it to work on your PC yet? Did you do the recommended reboots after deinstall and install? Why isn’t ASIO selectable in the hardware input drop down? W2SDR wrote: Why isn’t ASIO selectable in the hardware input drop down? 1. If you have no devices that have ASIO drivers installed then you will not see any ASIO options for them in the hardware input drop down. 2. If you have a device that does have an ASIO driver installed and the driver will only accept a single connection, after you've used it once it will not appear on any subsequent Hardware Input drop down lists. Try selecting it as Hardware OUTPUT A1 first, then see if it shows up on the Hardware Input A1 list. If you don't want to use it as an output, that's OK. Just select whatever other output you DO want as Hardware Output A2 and route your output there. What does the menu for hardware output A1 look like? If there is no UMC ASIO selection there I can only suggest that you need to reinstall your Behringer drivers. I have now configured the program for my Behringer ASIO hardware input. I re-initialized Potato in the menu and then selected the UMC ASIO Driver for the output in A1. Automatically the ASIO driver was then selected for hardware input in Channel 1. The key is to select Hardware OUT first!! W2SDR wrote: The key is to select Hardware OUT first!! Yes, perhaps you missed my post yesterday at 5:13PM where I wrote "Try selecting it as Hardware OUTPUT A1 first, then see if it shows up on the Hardware Input A1 list." I did read your post Scott and I posted what I did but I guess I wasn't totally clear about what has to be done. If on a new install of Potato if you had selected a hardware input driver BEFORE you select the ASIO driver in the hardware out section you cannot get the automatic ASIO selection in the hardware input section no matter what you do in the hardware out section after the fact. What has to be done is to re-initialize Potato in the MENU section, then select the hardware output first. That's an interesting observation, Frank. I recommend you report that behavior straight to the developer, Vincent Burel. I have found him to be quite receptive to bug reports.